Taker still has his mask on after Mabel broke his face with a legdrop. Taker chases after Sir Mo, allowing Mabel to jump him from behind. Undertaker no-sells and fights back with a flurry of punches. Mabel catches him with the sideslam, but Taker no-sells. Taker avoids a splash off the second rope, but Mo distracts him again, enabling Mabel to get a belly-to-belly and a legdrop. A splash puts Undertaker out, so Mo drags him out and puts him in the casket. They don’t bother to shut the lid, though. Yeah, Mabel’s kingdom was not the brightest in the ‘hood. Taker escapes, of course, and hits the flying clothesline on Mabel. Taker chokeslams Mabel and boots him into the casket. Mo tries to make the save, but Taker chokeslams him too, retrieves his melted down urn, and seals them both in the casket for the win at 6:12. The number of casket matches is inversely proportional to how good the Undertaker’s year is. Men on a Mission would disappear until Mabel had one more match in the “Raw Bowl” early in 1996. 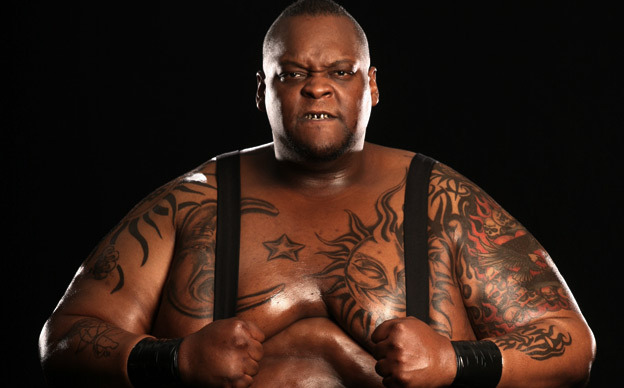 Mabel came back four years later as, Viscera, one of the Undertaker’s Ministry. (And before you write, yes, I know he technically came back as Mabel and was turned into Viscera that same night, but you get my point.